Editor's Note: By now, I'm sure you've heard about the profit opportunities created by U.S. President Donald Trump's steel tariffs. Well, Money Morning Director of Technology & Venture Capital Research Michael Robinson has found a company that will have a far greater impact on the steel industry than tariffs ever will. This tech firm is revolutionizing steel production and making a killing in the process…. The Dow Jones today traded lower in pre-market trading as investors awaited an announcement from U.S. Federal Reserve Chair Jerome Powell on interest rates. Markets are anticipating that the Fed will increase the benchmark rate and set a pace for up to four rate hikes in 2018. Now, here's a closer look at today's most important market events and stocks, plus Wednesday's economic calendar. 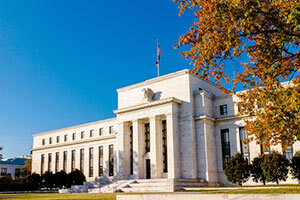 Markets will turn their attention to a critical announcement by the Fed on Wednesday afternoon. In his first conference as Fed Chair, Jerome Powell will announce whether the central bank will raise interest rates for the first time this year. Investors are also hoping to gather a better understanding of Powell's view on the state of the economy, especially in the wake of a $1.5 trillion tax cut and a $300 billion spending bill. Gold prices were up slightly as markets focus on the Fed's conference after the bell today. The price of gold hit $1,315 overnight, as investors anticipate that the Fed will hike interest rates by at least 25 basis points (0.25%). Gold is now off about 4% from the 18-month high that it hit in January. Tesla Inc. (Nasdaq: TSLA) shareholders will get a say in how much money that CEO Elon Musk will earn today. Musk is slated to earn $2.6 billion in stock option compensation tied to a series of performance metrics. Though several major investors, like T Rowe Price Group (Nasdaq: TROW), have come out in favor of the package, two major shareholder advisory firms – ISS and Glass Lewis – raised concerns about how significant the pay package is compared to compensation of other executives at other major public companies. In deal news, shares of MuleSoft Inc. (Nasdaq: MULE) popped more than 5.2% in pre-market hours (adding to the 27% gain they saw Tuesday). The company has agreed to be purchased by cloud computing giant Salesforce.com Inc. (NYSE: CRM) for roughly $6.5 billion. CRM stock was off 3% on news of the deal. Crude oil prices continue to tick higher thanks to a rise in geopolitical tensions across the Middle East. Markets are keeping a close eye on Saudi Arabia after its crown prince said the kingdom will consider the pursuit of a nuclear weapons program. The statement was made during an interview with "60 Minutes" last week. On the domestic front, traders will eye today's inventory report from the Energy Information Administration. The WTI crude oil price today was off 0.1%. Brent crude dipped 0.2%. General Mills Inc. (NYSE: GIS) will lead a busy day of earnings reports. The stock was off 6.3% this morning after the company topped earnings expectations by one cent but slashed its earnings growth forecast in the future. The company cited rising prices. Wall Street expects that the company will report earnings per share of $0.80 on top of $3.89 billion in revenue. The firm beat both numbers. Shares of Nordstrom Inc. (NYSE: JWN) are sliding 2.7% in pre-market hours after the family behind the retail giant announced it would end its quest to bring the company private. The Nordstrom family owns 31.2% of the company and faced opposition from the company's board for its $50.00 per share bid alongside private equity giant Leonard Green & Partners. It's a good day to be an investor in Amazon.com Inc. (Nasdaq: AMZN). The e-commerce giant has surpassed Alphabet Inc. (Nasdaq: GOOGL) as the world's second-largest company by market capitalization. Shares of AMZN stock are on the verge of topping $1,600 and ticking back toward their 52-week and all-time highs. Shares of FedEx Corp. (NYSE: FDX) are volatile in pre-market hours. After the bell, FDX stock popped more than 3% after the shipping giant topped earnings and revenue expectations. Optimism was also high after the company hiked its forward guidance and slashed its capex budget. However, the company has been the subject of negative headlines after an explosion tied to a serial bomber occurred in one of its warehouses earlier this week. Look for additional earnings reports from Guess? Inc. (NYSE: GES), Five Below Inc. (Nasdaq: FIVE), Winnebago Industries Inc. (NYSE: WGO), Wheaton Precious Metals Corp. (NYSE: WPM), Actuant Corp. (NYSE: ATU), Scholastic Corp. (Nasdaq: SCHL), and Herman Miller Inc. (Nasdaq: MLHR).